The CN Tower is one of Toronto's most celebrated landmarks. Located downtown in Ontario's bustling capital, the CN Tower offers you a central navigation point no matter where you are in the city, and a trip to the tower offers spectacular views, incredible engineering in action, and even a meal far above Canada's largest metropolitan city. At 553.33 meters (1,815 feet and 5 inches) the CN Tower held the record as the tallest building for more than three decades. It remains the tallest in the Western Hemisphere. As of 2015, the CN Tower held the record as the World’s Highest Outdoor Walk on a Building. Construction on the CN Tower began on February 6, 1973, and wrapped up about 40 months later in June 1976. In 2016, The CN Tower celebrated its 40th birthday with special events throughout the year. 1,537 workers toiled five days a week, 24 hours a day to build the CN Tower. The CN Tower was built at an original cost of $63 million. On April 2, 1975, onlookers gazed up in amazement as a giant Erickson Air-crane Silorsky helicopter placed the final piece of the CN Tower's antenna into place, officially making it the world's tallest building. The CN Tower was built to withstand an earthquake of 8.5 on the Richter scale (the Kobe earthquake in 1995 was 7.2 on the Richter scale). The upper reaches of the CN Tower were built to withstand winds up to 418 kmh (260 mph). In 1995, the CN Tower was designated a Wonder of the Modern World by the American Society of Civil Engineers. Lightning strikes the CN Tower an average of 75 times per year. Long copper strips run down the CN Tower to grounding rods buried below ground to prevent damage. 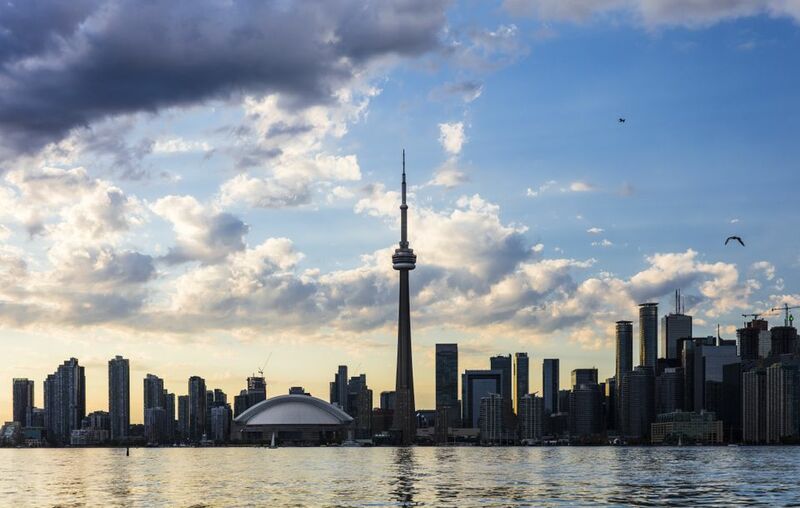 The CN Tower is an incredible 2.79 centimeters (1.1 inches) within plumb or true vertical. Six glass-faced elevators travel at 22 kmh (15 mph) to reach the observation deck in 58 seconds. On a clear day, visitors to the CN Tower's observation deck can see over 160 kilometers (100 miles)—that's all the way to Niagara Falls and across Lake Ontario to New York State. The CN Tower has a hollow 1200-foot hexagonal core providing stability and flexibility to the full height tower. The CN Tower's Glass Floor was the first of its kind when it was opened in June 1994. It is 23.8 square meters (256 square feet) of solid glass and five times stronger than the required weight-bearing standard for commercial floors. If 14 large hippos could fit in the elevator and get up to the Observation Deck, the Glass Floor could withstand their weight. The 360 Restaurant makes a complete rotation every 72 minutes, giving diners a changing view of Toronto more than 1,000 feet below.